Growing Up in Rural Georgia: Born Oct. 1, 1924, Jimmy Carter grew up on the red clay soil of a peanut farm in Plains, Georgia (pop. 600), during the Great Depression—a time and place that demanded thrift, hard work, and plenty of responsibility for a young boy. His family had been in Georgia since the 1700s, and he was the fifth generation to own and farm the same land in southwest Georgia near Plains. His father, James “Earl” Carter Sr., ran the peanut farm, store, and warehouse that sustained his family through hard economic times, and became a state legislator. His mother, Miss Lillian, practiced nursing in the community, without regard for the color of a person’s skin, heeding her own mind and morals in a segregated society. Courting Rosalynn Smith: Jimmy Carter and Rosalynn Smith both grew up in Plains, within a few miles of each other, and as a teen, Rosalynn was good friends with Jimmy’s sister Ruth. After his first date with Rosalynn while home on leave from the Naval Academy in the summer of 1945, Jimmy told his mother, “She’s the girl I want to marry.” The first time he proposed, she said no. Months later, he proposed again, and they were married July 7, 1946. It was the forging of a remarkable partnership that grew through the joys and demands of family, business, and politics. Naval Career: Jimmy Carter’s ambitions and talents led him beyond Plains, into the Navy, and around the world. His interest in the Navy began as a boy, with letters home from his Uncle Tom Gordy, a sailor stationed in the Pacific. After high school, he won an appointment to the U.S. Naval Academy at Annapolis and entered in 1943. His position as a young lieutenant in the nuclear submarine service was one of the most promising in the service. Admiral Hyman Rickover, known as the “Father of the Nuclear Navy,” had personally selected him for the duty. He was a senior officer of the pre-commissioning crew of the Seawolf, the second nuclear submarine. Return to Plains: As a long stream of neighbors, black and white, came to pay tribute to his father in the final days before his death from cancer in 1953, Jimmy Carter came to believe that he could make a greater difference by returning to his hometown than he could even as a rising Navy officer. “I had only one life to live, and I wanted to live it as a civilian, with a potentially fuller opportunity for varied public service,” Carter remembers. After they returned to Plains, Jimmy and Rosalynn Carter focused on building the family farm and rearing their children. Jimmy concentrated on improving the crop and connecting with the community, serving on county boards supervising education, the hospital authority, and the library. Rosalynn studied accounting and took over the office of the Carter farm supply business. Public Service for Georgia: In 1963, Jimmy Carter won his bid for the state senate seat in Quitman County after contesting the initial results—which had been rigged by the local “boss,” a state legislator backed by the old Democratic Party machine in Georgia. After losing the election for governor in 1966 to segregationist Lester Maddox, Carter ran again in 1970, and won. He became Georgia's 76th governor on Jan. 12, 1971, tackling disorganization in government and waste in the Capitol, improving race relations, opening state jobs to African Americans, achieving tax reform, and reforming the state’s prison system. Rosalynn Carter used her influence to help improve mental health services in the state. Race to the White House: Jimmy Carter’s rise to the presidency was one of the most remarkable ascents in American political history. He was all but unknown to the public through much of 1975. Less than a year later, he was the party’s candidate for President. When he ran for President, the Vietnam War had just ended, and Richard Nixon had resigned the presidency in disgrace. A deep cynicism about the federal government was growing, and earning people’s trust became a crucial goal of Carter’s campaign. The American people wanted a president and a government they could trust, and candidate Carter promised he would never lie to them. 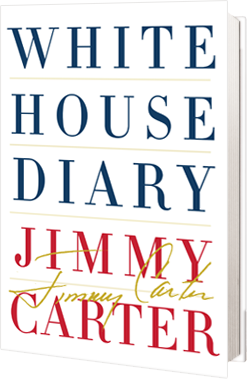 His secret weapons—his family and the Peanut Brigade, a group of some 100 friends from Georgia who went state-to-state knocking on hundreds of thousands of doors to vouch for Jimmy Carter in person. The tactic paid off with wins in the early races in Iowa, New Hampshire, and Florida, catapulting him from unknown to Democratic Party frontrunner. While this was a new strategy in the 1970s, today nearly every presidential candidate works hard to make a good showing in the early caucuses and primaries. President Carter’s Family: His wife, Rosalynn Carter, their four children — Jack, Chip, Jeff and Amy — and their families. Son John William (Jack) Carter was born July 3, 1947 in Portsmouth, Va., and is married to Elizabeth Sawyer Carter of Cleveland, Miss. Jack Carter’s children are Jason James Carter, born Aug. 7, 1975, and Sarah Rosemary Carter, born Dec. 19, 1978. Jason Carter is married to Katharine (Kate) Lewis Carter, and their two children —President Carter’s first two great grandchildren — are Henry Lewis Carter, born Sept. 2, 2006, and Thomas Clyde Carter, born Dec. 22, 2008. Sarah Rosemary Carter is married to Brendan Keith Murphy, and they are the parents of Josephine Beverly Murphy, born Dec. 29, 2009. Elizabeth Sawyer Carter’s children are John Michael Chuldenko, born Mar. 21, 1975, and married to Mirabai Rose Chuldenko; and Sarah Elizabeth Chuldenko Reynolds, born Mar. 22, 1978, and married to Stephen Sarre Reynolds, parents of Luella Bird Reynolds, born Oct. 1, 2009. Son James Earl (Chip) Carter III was born April 12, 1950, in Honolulu, Hawaii and is married to Becky Payne Carter of Parkersburg, W.V. Chip Carter’s children are James Earl Carter IV, born February 25, 1977, and married to Alison Lee (Sally) Hartley Carter; and Margaret Alicia Carter, born September 23, 1987, and married to Harold Edward (Eddie) Carter, parents of Irie Alicia Carter, born Sept. 19, 2009. Becky Payne Carter’s child is Casey Payne Gallagher, born May 7, 1986. Son Donnel Jeffrey (Jeff) Carter was born Aug. 18, 1952, in New London, Conn., and is married to Annette Jene Davis Carter of Arlington, Ga. Their children are: Joshua Jeffrey Carter, born May 8, 1984, and married to Sarah Jane Opp Carter; Jeremy Davis Carter, born June 25, 1987; and James (Jamie) Carlton Carter, born April 24, 1991. Daughter Amy Lynn Carter was born Oct. 19, 1967 in Americus, Ga., and ismarried to John Joseph (Jay) Kelly. Amy Carter’s son, Hugo James Wentzel, was born July 29, 1999. His Parents, Sisters and Brother: Deceased are: his parents, James Earl Carter Sr., in 1953; and his mother Lillian Carter, in 1983; as well as his sisters and brother: Ruth Carter Stapleton (Mrs. Robert T.), died in 1983; Gloria Carter Spann (Mrs. Walter G.), in 1990; and William Alton (Billy) Carter III, in 1988.